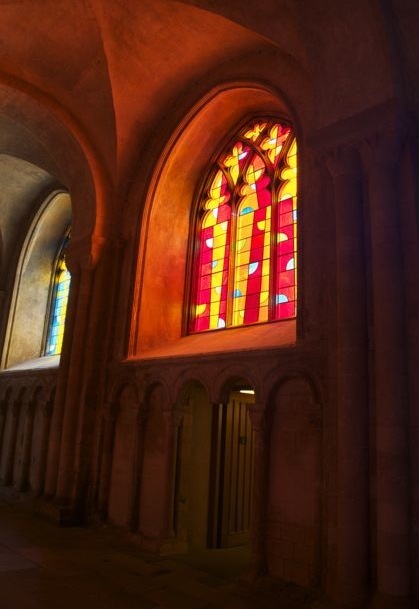 Earlier this year a contemporary, stained glass triptych was installed in Norwich Cathedral. First thought – what makes stained glass different to oil paintings, watercolours, sculpture, bronzes and most textiles, well, it lets light THROUGH. It is not just about surface reflection, but translucence. The most stunning stained glass windows work with this quality. Now here comes the second thought do we commission artists to design windows in glass or do we commission stained glass artists to create windows? In the past William Morris and Edward Burne-Jones both successfully designed windows as part of a broader view of art which was less sniffy about craft. The Arts and Crafts artist Christopher Whall worked in stained glass. 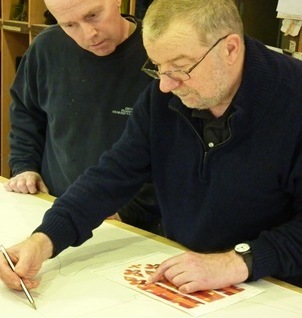 He originally trained as a ‘traditional’ artist at the Royal Academy, but he learnt and practised glass cutting, painting, firing and glazing so he had control and understanding when he began creating stained glass windows. In a similar way to architecture and site-specific sculpture, stained glass should work within its context and architectural setting. Simple shapes and clean lines give a balanced, unfussy contemporary feel. ‘form a single work of art, conceived as a a vibrant journey from the solemn dignity of the Nave into the architectural excitement of the North transept’. The artist working out his designs. 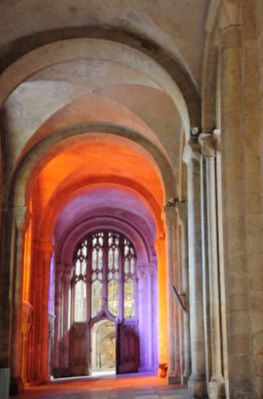 Photograph from the Norwich Cathedral website. 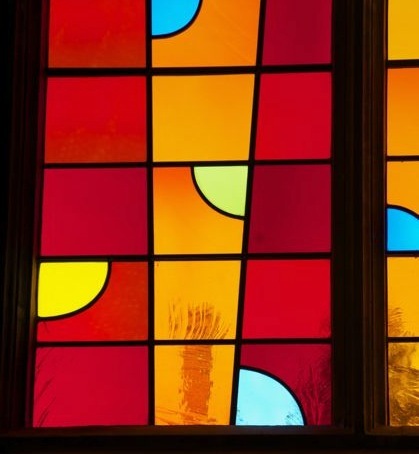 The designs for the windows were developed over the course of seven years as the artist developed his knowledge of working with glass instead of paint. The finished windows are installed in three bays on the north aisle with northern light flooding through glass into the Romanesque cathedral. I have seen quite a few contemporary coloured windows in medieval churches most are not particularly successful. Here, I see that the shapes and colours of these three windows work well when viewed directly with the even northern light pouring through. As yet I’ve only seen them on a bright, sunny summer’s day. View down the north aisle as summer light floods through. However, remember these are windows shining light into an interior space. A tall, narrow, stone Romanesque space and the effect of the coloured light shining on the interior is striking, but for me too obvious. I will be interested to return in the middle of winter to see if the reduced light levels result in a more subtle illumination of the aisle. I am not adverse to colour, or the contemporary placed within a 12th-century building, but the orange and purple haze sequence combines to make the aisle look more like a fairy grotto. 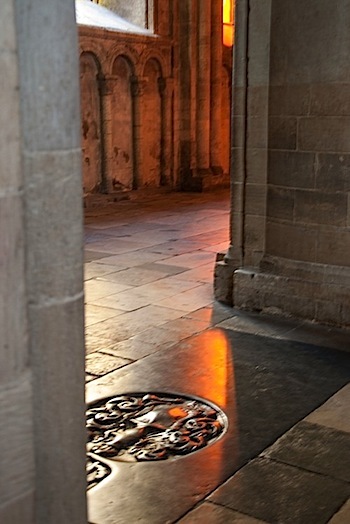 Just a final thought – I would be fascinated to glimpse the process of commissioning such large scale works in the twenty-first century for such a significant Norman cathedral. Just a glimpse – perhaps sometimes less is more.